This video-based tutorial teaches a 7-loop flat braid with an extra move in some of the loop transfers. I call that extra move color-linking. It’s a way to link loops of different colors, so that whichever color or colors you choose will stay within one narrower section of the braid, instead of migrating across the whole braid. Color-linking is optional in a braid—it’s a technique that gives you more control over the color patterning. You can choose to do it for the whole length of the braid, or you can stop linking for some sections, or keep linking some of the color groups but not others. I demo linking here in flat braids, but it can be done in other types of braids as well. Linking different-color strands in braiding is not something I invented! It was done in several of the braids notated in the 15th and 17th C. English loop braiding manuscripts, as well as probably every other complex braiding tradition, from kumihimo to sprang to ply-split braiding. It’s an obvious thing to try, if you are into experimenting, which is how I started doing it, but later when I read Noemi Speiser’s book Old English Pattern Books for Loop Braiding, I realized it was the same thing as what the old pattern books called “changing twice” for certain desired color-patterns. In the “Notes” section at the end of this tutorial, there are photos and set-ups for two color-linked 9-loop braids, and a 13-loop version, also a photo of a 15-loop flat double braid with color linking. The samples in most of these photos were made with embroidery floss, which makes a small, fine 7-loop braid. In the video, I braided with a thicker cotton yarn (about the same as doubled embroidery floss) – a thickness that seems to be called ‘sportweight’ in the U.S. In photo below, the upper braid is the embroidery floss pattern sampler I showed in the beginning of the video, and the lower braid is the one I made in the video, using cotton knitting yarn (old Elann.com “lara” and similar multi-strand yarns). In a flat braid, any colors that are not “mirrored” on both sides from the center must be bicolor loops – here the blue and orange strands are bicolor blue/orange loops; the white and black strands are single-color white and single-color black loops. If you haven’t made “regular” 7-loop flat braids before, learn them first, from my “Continue Here” 7-loop square and flat braids tutorial. 0:30 Showing the various color-patterns in my sample braid that can be made with the same loop color set-up. 0:00 View of braid sample showing other possible patterns. 1:26 Braiding moves for the 2nd color pattern: no linking on left loops, only on right loops (3-color chevron pattern in the center of the braid, black border on the two edges). 4:15 Bicolor loops have already changed to “turquoise up/ orange down” and are now changing back to “orange up”. 4:55 All colors back in original starting position. Checking for mistakes and looking at pattern in braid. 0:00 Third pattern–a variation of the second pattern that requires another type of linking: turning bicolor loops twice to keep the same color uppermost. 1:32 How to turn bicolor loops TWICE to keep the same color on top. 2:56 A faster way to make that double turn of the bicolor loops. 5:24 Comparing the last two patterns (taught in this video and previous video-part 2). My Terminology page has a description of these two quite different ways to link colors here. That second type of color-linking I also taught previously, in another color-pattern for a flat 7-loop braid. That was in my Color-Pattern Planning post. It was used in the lower braid in the photo below, to create the two lengthwise columns of dark purple and gray (from the purple/gray bicolor loops). The contrasting orange pattern is formed by two single-color orange loops. Two 7-loop flat braids (wool). 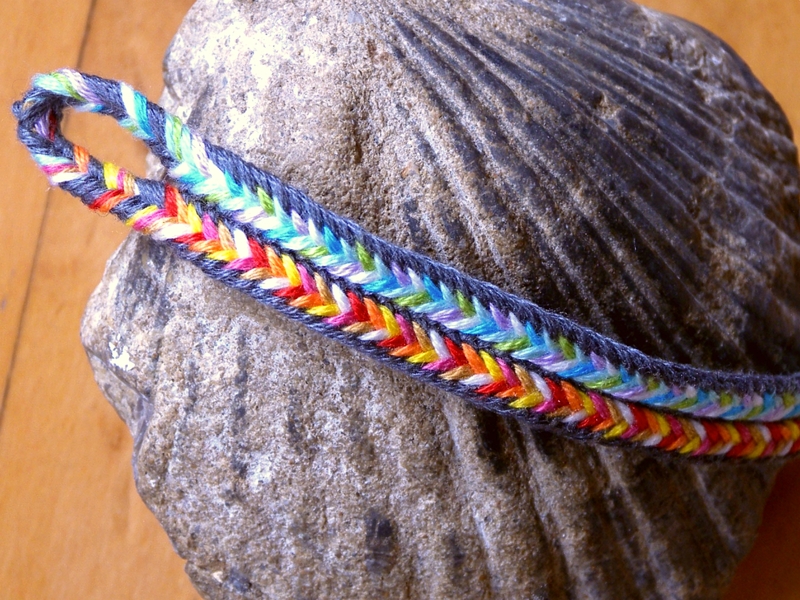 Lower braid has color-linking at the single turned transfer (bicolor loops are turned twice). 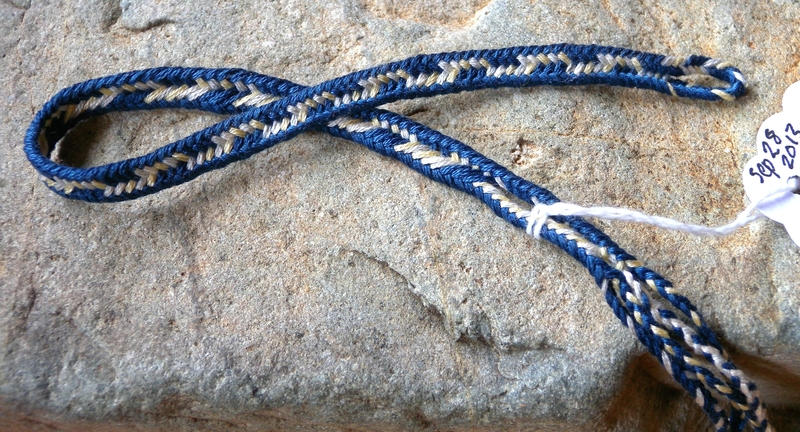 Upper braid is an example of a typical 7-loop flat braid with no color-linking (and no bicolor loops). 5 bicolor purple/gray loops, 2 orange loops. Left: A,B orange; C,D bicolor, with purple shanks up. Right: A,B,C all bicolor loops, purple shanks up. For this pattern, all the purple shanks should be up on both hands, and should stay that way throughout the braiding procedure. Turning the bicolor loop twice causes the upper and lower colors to link around each other, rather than to cross each other. Each color will stay on separate layers of the braid, as in a divided braid of bicolor loops. In the upper half of that braid, slightly to the right, there’s a short section in which I did not turn loops twice—that’s the section where the purple and gray colors (of the bicolor loops) zig-zag back and forth across the braid instead of keeping to separate columns. That is what makes color-linking so fun—it gives you the ability to play around with the pattern. Another possibility is to alternate between 2 patterns in a very regular repetition that itself creates an overall pattern. The two braids in the photo below start out with basically the same color-pattern. But in the black and multicolor braid, I periodically interrupted the color-linked columns with 7 braiding cycles of no linking (those are the somewhat M or W-shaped interruptions of the lengthwise pattern). Two 7-loop flat braids with variations of the same pattern. In the lower braid, the colors of the two columns switch sides. The M-shaped interruptions in the pattern are the sections where I did no linking, so the colors could switch. Upper braid’s bicolor loops are pink + green. Lower braid’s bicolor loops are each slightly different, but each one has a pale cool-color shank and a pale warm-color shank. Left index loop always transferred with a turn, no other transfers turned. Braided as in the first pattern in the videos. It will take 7 braiding cycles for the dark colors to return to the A and B fingers and the bicolor loops to return to the Left C and D, and Right C fingers. At that point, return to linking at both color-boundaries. Cool colors and warm colors will now be in opposite arrangement, so will line up on opposite sides of the braid. If you don’t want the cool and warm colors to switch sides in the braid, keep doing the no-linking section for 14 cycles instead of 7. That will bring the loops back to their exact original positions, including the shanks of the bicolor loops. The zig-zag interruption sections will be twice as long. The column pattern has a one-cycle pattern repeat, so it can be braided for any number of cycles. The length of my column sections varied from 6 to 8 cycles long. If I had been more careful about counting the cycles while braiding, the spacing would have looked much better! No bicolor loops. 2 turquoise, 3 white, 2 golden brown loops. Left index loop always transferred with a turn, no other transfers turned (both braids). This is “Set-up 1”— the starting color set-up for all three flat braid patterns in the lower braid. 2nd pattern (Brown borders, turquoise and white central chevrons): Left loops NO linking. Right loops linked to bring brown loops back to A and B fingers at the end of each braiding cycle. Braid until all colors return to their starting color set-up on the fingers (listed above). At that point, resume linking the left loops as well as the right. Check to make sure that all your loops are in the starting setup listed above. Then, keep linking the left loops, but don’t link the right loops. 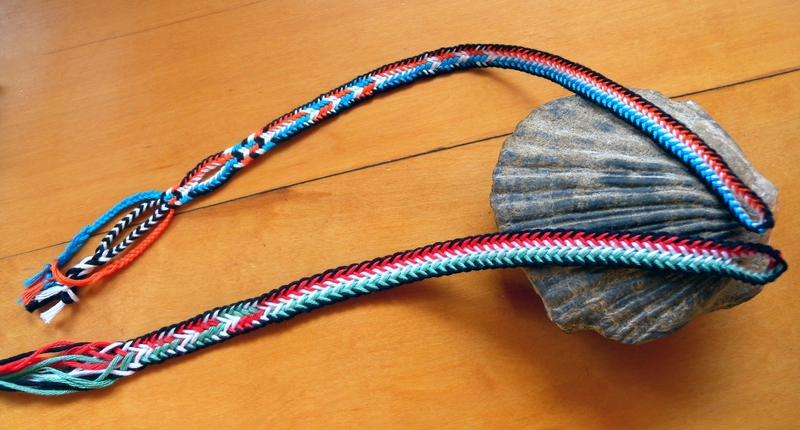 Borders of braid have diagonal brown and white stripes, center of braid is a lengthwise turquoise stripe. Some of the patterns start with Set-up 1 on fingers as described above. The first section of the upper braid has divided and then square braiding with no linking. Then, in the next pattern the braid opens into a flat braid with no linking. For those “no linking” sections, the starting set-up on the fingers can be either Setup 1 or Setup 2 above, with identical results. Next pattern is started when loops have arrived at Set-up 2 position. Left loops linked, Right loops NOT linked. Pattern has central brown column, outer turquoise and white diagonal stripes. Next pattern has same braiding moves, but starts with Set-up 1. Continue the pattern you are braiding until your loops have returned to that pattern’s “starting setup” position. Then, braid without any linking until colors on La,b and Ra,b have switched, and white loops are between them. Next 2 patterns are the same as the first and second patterns in lower braid. Last 2 patterns are the exact opposite—turquoise and brown must switch hands (braid without linking until they have switched). Color-linking can also be done with 5-loop and even 3-loop braids, but the resulting color patterns will be very reduced. Color-linking is my term for a basic color-manipulation technique that is common to many braiding traditions—including ceinture fléchée/ Métis sashes (“finger weaving”), kumihimo, kute-uchi [update: see my more recent Itsukushima braid post for an example], and ancient Andean braids. It was used in some of the medieval and 17th century braids described in the old loop braiding manuscripts, in both forms — turning a bicolor loop twice so the two shanks become linked, as well as “changing” twice—bringing one loop through another and then repeating this so both shanks of two loops link around each other. Typically this is done with the two loops of the loop exchange (the last move of a double braid). But it can also be done as part of a loop transfer, with any two loops that would normally cross each other. See Anne’s note in the comment field below, with a link to a photo of color-linking in a ply-split braid. In these videos the first color-linking pattern I demo is done symmetrically, on both sides of the braid, whenever a loop from the A-finger (index) passes through the loop on the C-finger (ring finger). I picked this pattern because I thought color-linking might be easier to learn if both hands performed the same motions. 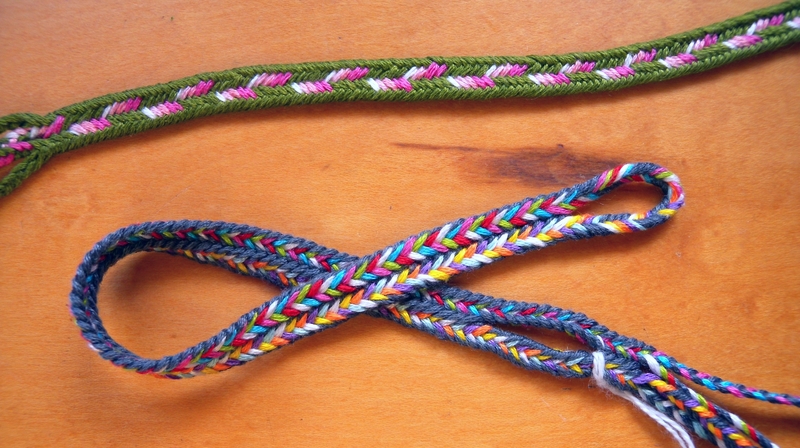 7-loop flat braid, with color linking between left and right loops. Flat braid. Left A loop always transferred with a turn. Left 4 loops and right 3 navy loops are linked throughout braid. Because of this, at the start of each cycle the white and bicolor loops are all back on the left hand, and the navy loops are all back on the right hand. The linking move doesn’t happen until after both the left and the right loop transfers are finished. Left transfer happens normally (no linking move yet). La ends up on Rd (with a turn). Shift L loops and tighten. BEFORE right loops shift up, Ld ALSO takes Rd (right little finger loop) and holds it toward the tip. Now the Rd-finger takes the lower of the two left d-loops and lifts it off and over the upper left d-loop (the one near the tip). This links the two loops and they both end up back on the original hand they started out on, though now on a different finger of that hand. Shift right loops, and tighten. The particular motions you use to accomplish the color-linking might look a bit different in different parts of the braid, but the principal is the same: loops of two different colors become linked around each other in order to make a U-turn and head back in opposite directions. They don’t pass straight over/ through each other and keep going, the way they normally would in the braid. There is always an extra step at some point in the cycle. The extra move brings one loop back through the transferred loop that just came through it. Or you might do it this way: by bringing the just-transferred loop back over/around a loop it just came through—produces the same net result. Flat braid. However, for the pattern in the photo, the right A loop must always be transferred with a turn, not the left. Left and right loops are linked. 5 bicolor loops, each one different. The colors of the upper shanks will all line up on one side of the braid, and the colors of the lower shanks will line up on the opposite side of the braid. 9 and 13-loop flat “square” type braids, and a 15-loop flat double braid, all with color-linking. In the 15-loop double braid at the bottom, the gold loops are never linked, so they move freely across the braid, while the other color groups always link to rather than cross each other (except for the gold loops). The green, white, and purple areas never cross each other. 13-loop flat braid (flat 2-transfer ‘square braid’ type, not a flat double braid). Linking happens on both the left and right loops, but in different places. On left the color-border is between the B and C loops. On the right hand, the color-border is between the C-loop and the D-low loop—requires a temporary hold of the D-mid and D-high loops for the linking move. See full copyright restrictions and permissions at the bottom of the sidebar (if you are on a small screen, the ‘sidebar’ may appear at the bottom of your screen). Hello, i just wanted to thank you. I am a 43 year old father of 3. My youngest are my girls. Ages 10 and 15. Well at their ages they start breaking away from dad and seeking out the mall and friends. No more daddies little girls. Well I have been big into paracord for a while,but when I came across a video on youtube for fingerloop braiding I was hooked. After watching countless videos yours was the only ones I could understand and follow. I showed this to my girls and they went crazy too. It seems that maybe just for a little while longer I get to be the king in the eyes of my princesses. I am permanently disabled and recently found out I have cancer to boot. I cherish every moment with my loved ones and your videos have given me the daddy daughter time I cherish so much. Thank you so much. Thanks so much for your note! I am thrilled that you and your daughters have gotten so much from my tutorials! Wishing you continued joy in your daughters and in life! A lot to sink one’s teeth into here! The color link, as you name it, reminds me of a technique in ply split braiding called twined interlinking which is usually used to control color in single course oblique twining (SCOT). If you look at Linda Hendrickson’s facebook page, https://www.facebook.com/LindaHendricksonTabletWeavingPlySplitting , the second from right braid at the top is an example of this, keeping the green in the center and blue on the edges. Use the tabs under my header picture to find the loop braiding tutorials or information you want. My 'About' tab at the far right hides a multitude of general info pages, including my contact info, cool historical loop braiding info, information on books and other loop braiding sites, and more. Search this site in the search box below. Pin me on Pinterest! For links to other sites, as well as archives for this site, scroll down this sidebar. Thanks for visiting Loop Braiding! Search this blog in the search box above. Braids 2012 and Braids 2016 Conference Proceedings books are shown below. Let me know if any links are broken - Braiders Hand (U.S.), and The Braid Society (UK) occasionally change the urls for their products. 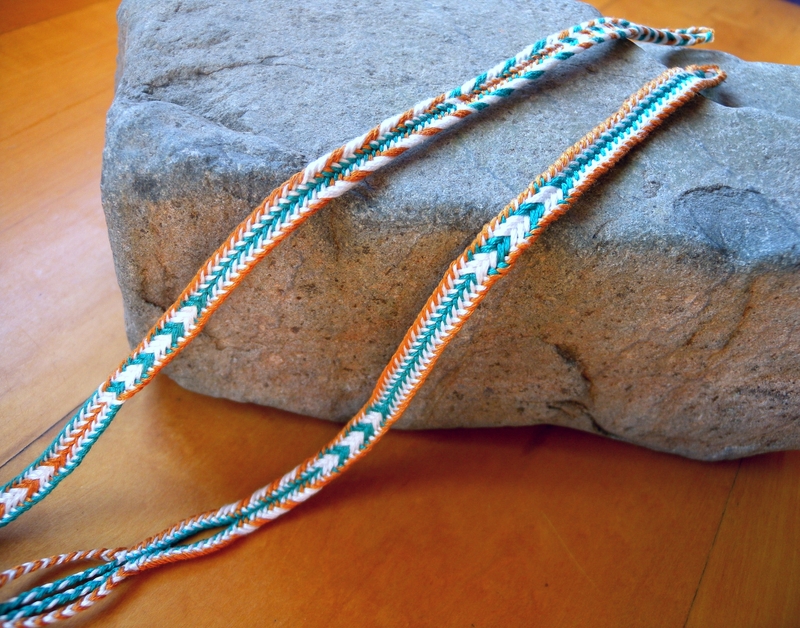 Includes my 12-page article on all the double braid variations. See table of contents here. My article in Threads That Move is on the many variations of loop braided 'double braids,' including several not covered in this blog, with some practical how-to information. Any braids you make using my tutorials are wholly yours, may be marketed and sold. However, the content of this site (text, images, videos) is copyright protected, with only limited and specific sharing of content allowed, see my full copyright notice at the bottom of this sidebar. For example, 'pinning' on Pinterest of my own braids in my own photos is welcome. Downloading or printing my content for your own personal use is also fine. But please do not distribute, "repost"/ "reblog" any of my text, images, or videos in any other way. Any links you make to this blog are much appreciated! The braids in my header photo are described here. Some are traditional, some are original, and some are a little of both. I have tutorials on this blog for four of them, as well as for many braids not shown in the header photo. 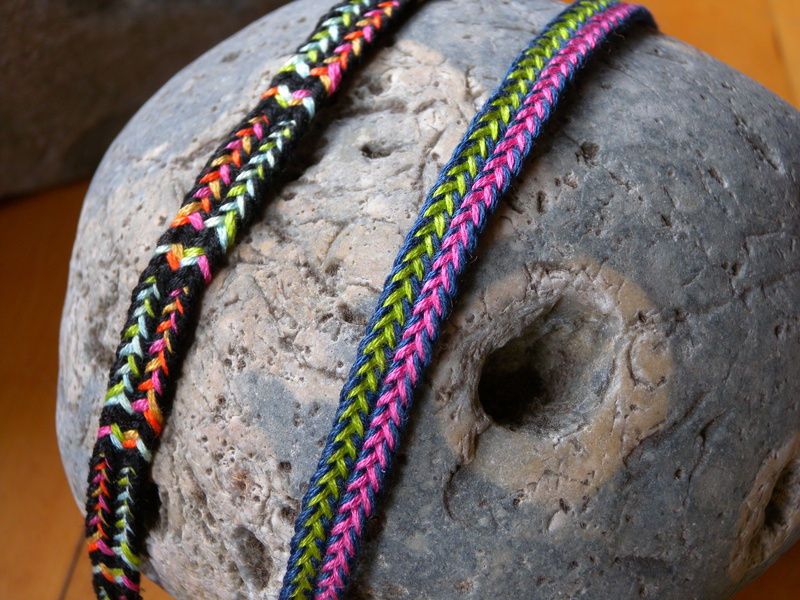 Maarten-Jan's tutorial: 16-strand sling braid, different color-pattern. Giovanna Imperia Designs –Wire and other unusual braiding materials. With the exception of photos of or by others, or of the work of others, the content of this blog (Loop Braiding) may be shared and distributed non-commercially, in print or by email, if and only if any such content includes this copyright notice in full, as well as the full url(s) of the shared content. Content of this blog may not be posted, reposted, or embedded online, sold in any form or format, or used in fee-based workshops without my express permission, with the following limited and specific exceptions: My "Scribd" document on 3-loop braids may be embedded on non-commercial websites; and "Pinning" on Pinterest of my photos of my own work is allowed. For the purpose of this copyright, "non-commercial" means the site-owner derives no monetary or material compensation or income from the website in which my document in embedded; or from any advertisements, links or endorsements on said website. Links to Loop Braiding or to any of its content are welcome and much appreciated!